DUNE joins the elite club of physics collaborations with more than 1000 members. Sometimes it takes lot of people working together to make discovery possible. More than 7000 scientists, engineers and technicians worked on designing and constructing the Large Hadron Collider at CERN, and thousands of scientists now run each of the LHC’s four major experiments. Not many experiments garner such numbers. On August 15, the Deep Underground Neutrino Experiment (DUNE) became the latest member of the exclusive clique of particle physics experiments with more than a thousand collaborators. CMS is one of the two largest experiments at the LHC. It is best known for its role in the discovery of the Higgs boson. The “C” in CMS stands for compact, but there’s nothing compact about the CMS collaboration. It is one of the largest scientific collaborations in history. More than 4000 people from 200 institutions around the world work on the CMS detector and use its data for research. About 30 percent of the CMS collaboration hail from US institutions. A remote operations center at the Department of Energy’s Fermi National Accelerator Laboratory in Batavia, Illinois, serves as a base for CMS research in the United States. 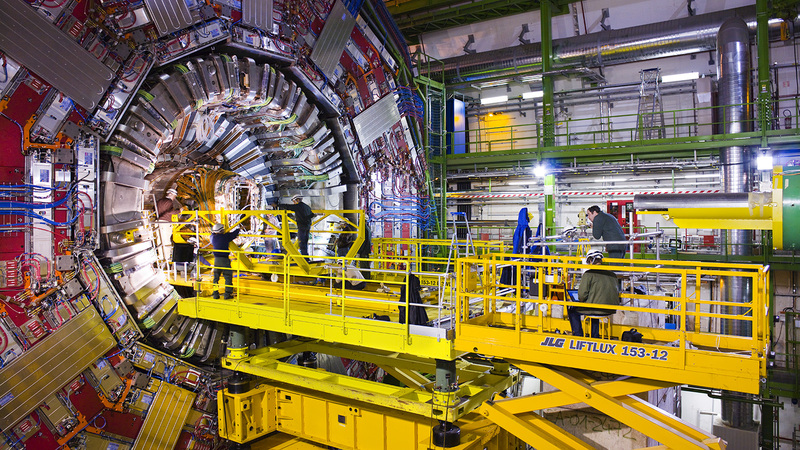 The ATLAS experiment, the other large experiment responsible for discovering the Higgs boson at the LHC, ranks number two in number of collaborators. The ATLAS collaboration has more than 3000 members from 182 institutions in 38 countries. ATLAS and CMS ask similar questions about the building blocks of the universe, but they look for the answers with different detector designs. About 30 percent of the ATLAS collaboration are from institutions in the United States. Brookhaven National Laboratory in Upton, New York, serves as the US host. The Linear Collider Collaboration (LCC) is different from CMS and ATLAS in that the collaboration’s experiment is still a proposed project and has not yet been built. 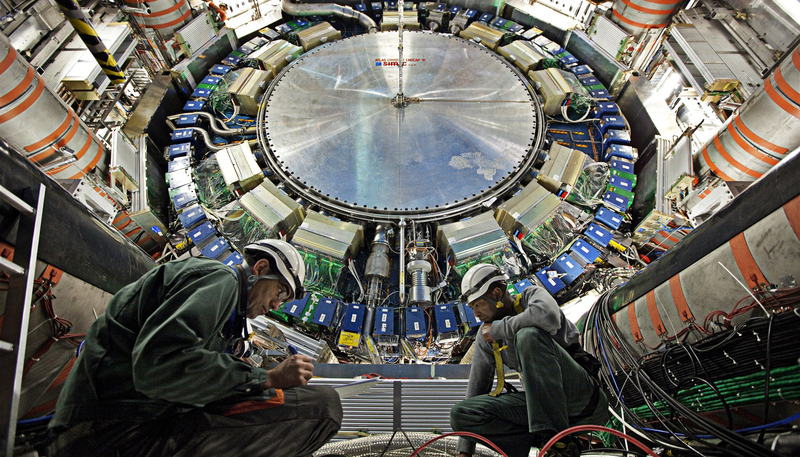 LCC has around 2000 members who are working to develop and build a particle collider that can produce different kinds of collisions than those seen at the LHC. LCC members are working on two potential linear collider projects: the compact linear collider study (CLIC) at CERN and the International Linear Collider (ILC) in Japan. CLIC and the ILC originally began as separate projects, but the scientists working on both joined forces in 2013. Either CLIC or the ILC would complement the LHC by colliding electrons and positrons to explore the Higgs particle interactions and the nature of subatomic forces in greater detail. ALICE is part of LHC’s family of particle detectors, and, like ATLAS and CMS, it too has a large, international collaboration, counting 1500 members from 154 physics institutes in 37 countries. Research using ALICE is focused on quarks, the sub-atomic particles that make up protons and neutrons, and the strong force responsible for holding quarks together. The Deep Underground Neutrino Experiment is the newest member of the club. This month, the DUNE collaboration surpassed 1000 collaborators from 30 countries. From its place a mile beneath the earth at the Sanford Underground Research Facility in South Dakota, DUNE will investigate the behavior of neutrinos, which are invisible, nearly massless particles that rarely interact with other matter. The neutrinos will come from Fermilab, 800 miles away. Neutrino research could help scientists answer the question of why there is an imbalance between matter and antimatter in the universe. Groundbreaking for DUNE occurred on July 21, and the experiment will start taking data in around 2025. A few notable collaborations have made it close to 1000 but didn’t quite make the list. LHCb, the fourth major detector at LHC, boasts a collaboration 800 strong. Over 700 collaborators work on the Belle II experiment at KEK in Japan, which will begin taking data in 2018, studying the properties of B mesons, particles that contain a bottom quark. 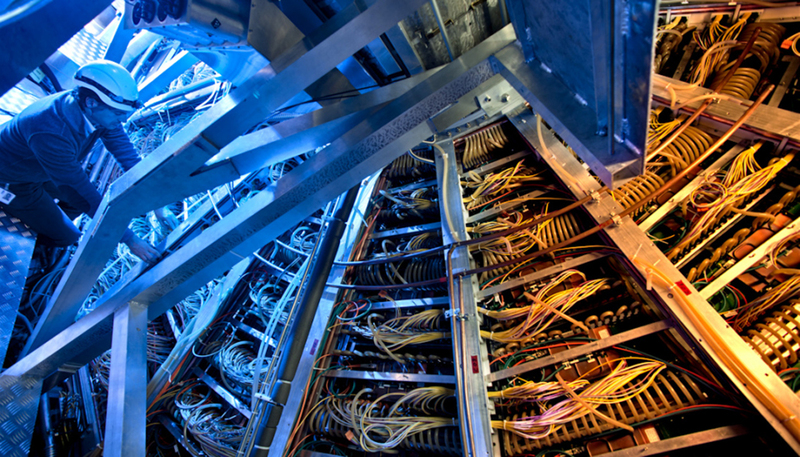 The 600-member BaBar collaboration at SLAC National Accelerator Laboratory also studies B mesons. STAR, a detector at Brookhaven National Laboratory that probes the conditions of the early universe, has more than 600 collaborators from 55 institutions. The CDF and DZero collaborations at Fermilab, best known for their co-discovery of the top quark in 1995, had about 700 collaborators at their peak. Scientists looking for tiny particles off the coast of Italy stumble upon a much bigger research subject. The Japan-based experiment is one step closer to answering mystifying questions about antimatter. Boston University physicist Tulika Bose explains why there's more than one large, general-purpose particle detector at the Large Hadron Collider. This month scientists embedded sophisticated new instruments in the heart of a Large Hadron Collider experiment. Sometimes being a physicist means giving detector parts the window seat. Go inside the new detector looking for why we’re here.